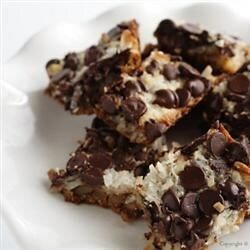 "A gluten-free version of classic magic cookie bars with layers." Mix graham cracker crumbs and melted butter together in a bowl; press into an 8x11-inch glass casserole dish. Pour condensed milk evenly over the crust. Sprinkle chocolate chips, coconut, and pecans evenly on top and press down. Bake in the preheated oven until edges are golden, 25 to 30 minutes. Let cool before cutting.